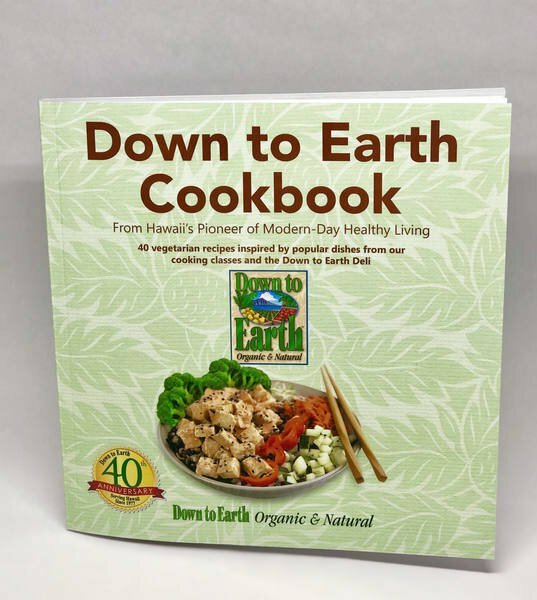 HONOLULU, HI (Dec. 13, 2017) — Down to Earth Organic & Natural has published its first Cookbook and will begin selling it in its stores on Thursday Dec. 14th. The “Down to Earth Cookbook” is a soft-cover 112-page book that includes 40 vegetarian recipes, one for each year of the company’s history, and beautiful pictures of each dish. The recipes are a collaboration by vegetarian chefs of the Community Outreach Team at Down to Earth. Fergusson explains that the recipes selected for this cookbook are inspired by many of the most popular dishes from Down to Earth’s cooking classes and its delis. “The recipes reflect our dedication to excellence that drives every aspect of what we do at Down to Earth,” he adds. The Down to Earth Cookbook will be sold in Down to Earth stores for $19.99 beginning next Thursday Dec. 14th It will be sold online for the regular price of $33.95 by publisher Balboa Press on Amazon, Barnes & Nobel, and other websites in its distribution network. An e-book version will sell online for $3.99.